At the age of 15, I’ve yet to get my driver’s license and graduate from high school. I still haven’t discovered the truth about life─my life. But one thing is certain, I want to be a writer. Luckily, you don’t have to be a certain age for that. I’ve yet to publish my work. I’ve started a blog (even though I’m practically writing to myself) and I’ve entered into a few different contests, including Laura’s Annual Junior Authors Short Story Contest. I didn’t even make it as a finalist. I was disappointed, sure, but then after thinking about it for a while, I came to the conclusion that just because I didn’t win, I wasn’t a horrible writer with my future crumbling before me. My short story just needed work and there were many other people who wrote wonderful stories. The competition was tough. I will enter the contest again and again until I’m too old, even if I never win. Why? Because I love writing and I know I have to persevere to get ahead. I’m currently writing a novel that I plan to publish when I finish. When I start thinking that my writing is horrifyingly bad, I think exactly this: Tiffany, you are writing for yourself and besides, when you do publish, there is always somebody that will enjoy your writing. 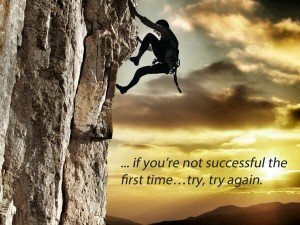 My favourite catch phrase is, “try, try again.” So if you’re not successful the first time…try, try again. Whether you are really good or need improvement, the only way you will get better is if you believe in yourself and your dream is big. When I say big, I mean really big, like out- of-your-comfort-zone big. You have to believe in yourself before you can even believe in your writing. I want to be a writer, you want to be a writer, we all want to be writers but only the ones who take the next step forward, even when they are about to collapse from exhaustion, will get where they want to be. I’m going to try to get there, whether I hate my work at times or people tell me that I don’t have a chance. I will make it work for myself. There are so many writing opportunities out there, either working for yourself or somebody else. One of them is meant for me. The goal is to be the best you can be, even when it feels like the sky is falling. Please, be true to yourself and love your writing. Your best critic is you. Tiffany Smith is a 15 year old writer from the United States. Tiffany says, “Writing is as necessary to me breathing.” She has just started a blog to write about her reading and writing passions and she is currently writing a novel. Check out Tiffany’s Blog. Great advice. I would love to see your work on the shelf someday. Good luck with your writing! Thank you! If you’d like you can check out my blog (for more of my writing) http://fearlessreads.blogspot.com/ or my Wattpad page (which I just signed up for) http://www.wattpad.com/user/TiffanySmith16.